The Browse menus in AtoM allow users to browse complete lists of archival descriptions, as well as digital objects, authority records (for people and organizations), places, subjects and functions. 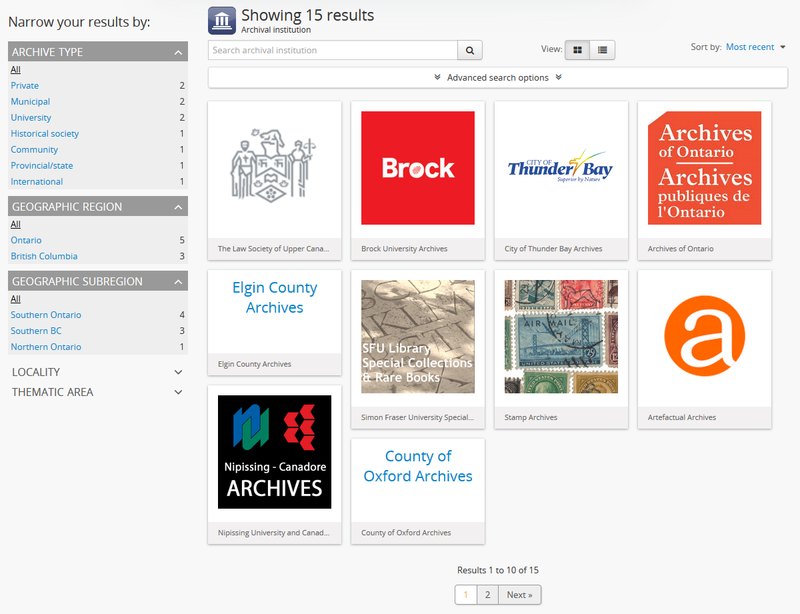 In multi-repository installations, users can also browse archival institutions. Most browse functions are available for all users, authenticated (logged-in) or not. Browsing options available only to authenticated users, including donors and accession records, are outlined below. From any page in AtoM in the default theme, the Dominion theme, the following browse options are available from the drop-down browse menu beside the search box in the header bar. There are also browse links included on the home page - see Home page for more information. The browse options listed below are in their default order, however, adminstrative users can change the order, or remove browse options, through the Admin-Menus menu (see: Manage menus). Click the Browse menu, then click on Archival descriptions. When arriving on the archival description browse page, a top-level description filter is engaged by default, meaning that all results shown are parents with or without children, but without any higher levels of description above them in the hierarchy. Users can disengage this filter by clicking the X on the “Only top-level descriptions” filter tag at the top of the results (see Using the top-level description filter). The automatic sort is alphabetic by default for public users, but users can also change the sort to most recently updated, or by reference code, using the sort button located at the top-right of the page above the results. Administrators can change the default sort order on search/browse pages for both public and authenticated (i.e. logged in) users, in Admin > Settings > Global. For more information, see: Sort browser (users) and Sort browser (anonymous). Users can narrow the results list using the available facet filters on the left-hand side of the screen. For more information on using the facet filters in AtoM, see: Facet filters; especially Using facet filters in AtoM. 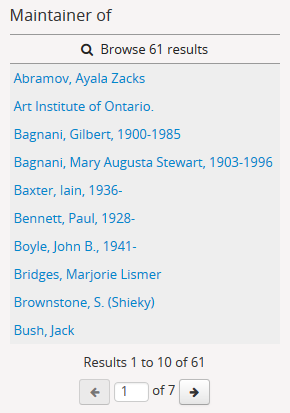 At the top of the archival description browse page’s list of results, the number of descriptions with digital objects is available and the user can click to see only results with digital objects. By default, AtoM will display 10 results per page; if there are more than 10 descriptions, a pager will be provided at the bottom of the results. Administrators can change the default number of results returned per page in Admin > Settings > Global. For more information, see: Results per page. Level of description - i.e. fonds, series, file, item, etc. The level of description will be diplayed next to the orange identifier, below the title of the record. Publication status - if a description’s publication status is “draft” (i.e. it is not visible to public users), the draft status will be indicated in the stub record. Description - if a scope and content note has been included in the archival description, its first 2-3 lines will be visible here for greater context. Identifier - if a reference code or other identifier has been added to the record, the results will display this in orange, beneath the title. Creation dates - if dates of creation have been added to the record, these will display on the same line as the identifier and level of description. Part of - if the record is the child of a hierarchical archival unit (e.g. a file in a fonds, etc), the title of the parent record will be displayed as a hyperlink beneath the identifier, level of description, and creation dates. Creator name - if a creator’s authority record has been linked to an archival description, the results stub will display the creator name below the scope and content summary. There are several ways to explore lower-level records (i.e. children) within an archival unit (such as a fonds, collection, or series). Each will be described below. 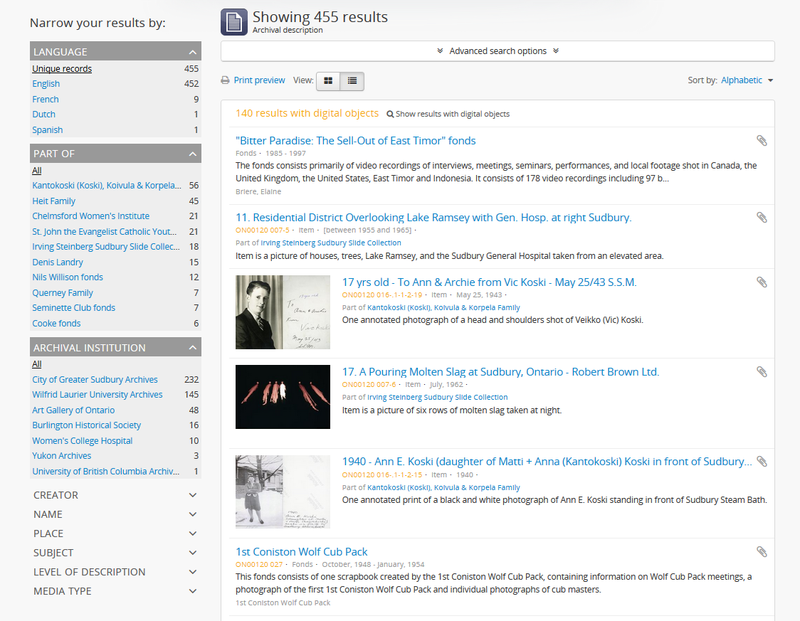 Using the Browse menu located in the The AtoM Header Bar, navigate to Browse > Archival descriptions. For more information on navigation in AtoM, see: Navigation in AtoM. By default, AtoM will display only top-level parent records when arriving on the Browse page. This limits what you see to the highest levels of description. Choose a description by clicking the hyperlink description name. To see all child-l;evel descriptions, You can display all results by clicking the X on the “top-level descriptions” filter tag. You can continue to refine your browsing using facet filter or Advanced search. When arriving on a search or browse page, you can use the “Part of” facet filter to limit results to children contained within an archival unit such as a fonds or collection. Note however that at present, the AtoM facet filters will only show the top 10 results for any facet - so this method will only work if your target archival unit is included in the facet’s display (see the section below on Using the top-level description filter if your target archival unit is not included in the “Part of” facet filter). Using the Browse menu located in the The AtoM Header Bar, navigate to Browse > Archival descriptions. Turn off the top-level descriptions filter. You can display all results by clicking the X on the “top-level descriptions” filter tag. Click on the name of the archival unit (e.g. fonds or collection) whose lower-level records (children) you would like to explore. AtoM will reload the page with the results filtered to the chosen archival unit. This will be indicated, and can be quickly removed, via the filter tag with the name of the unit at the top of the search/browse results page. You can continue to apply further facets and fliters as desired to narrow your results within the selected archival unit. If you are already on the view page of an archival description that includes a descriptive hierarchy (i.e. 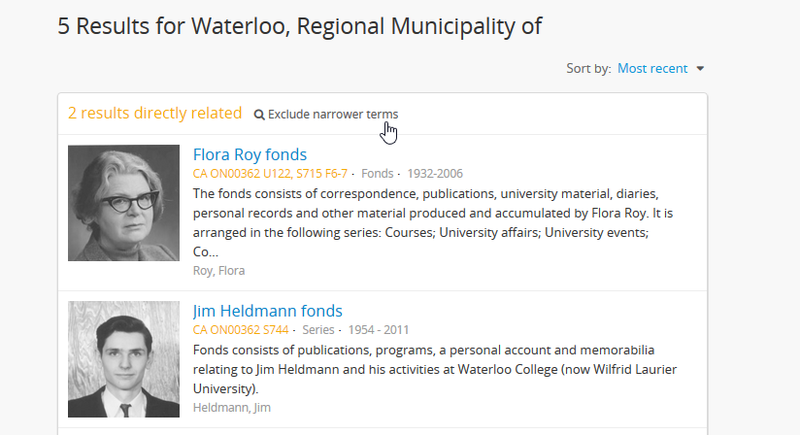 a top-level description such as a fonds, collection, or series that has lower-level children), you can explore the descriptions contained in the archival unit using the browse buttons included in the “Explore” section of the right-hand context menu. For more information on context menu items in AtoM, see: Context menu and Recurring page elements. There are two options for browsing within an archival unit included here - the “Browse as list” button, and the “Browse digital objects” button. Additionally, if it has been configured by an administrator, there may also be an option to view an inventory. This section will describe the “Browse as list” button - see the Browse digital objects button and Browse inventory list sections below for the other options in this part of the context menu. The “Browse as list” and the “Browse digital objects” links will appear in the right-hand context menu in all cases - even if there are no lower-level descriptions or digital objects to browse. So, it is possible that clicking on the link will lead to a results page with 0 results. Navigate to an archival description that is part of the archival unit whose children you wish to explore - it does not have to be the top-level parent record. For more information on searching, browsing, and navigation in AtoM, see: Access content. In the right-hand context menu, locate the Explore section - you will see browse options listed there, including the “Browse as list” button. Click on the “Browse as list” link. AtoM will redirect you to a browse page, limited to the current archival unit - this will be indicated by the filter tag at the top of the browse page with the name of the top-level description. If you click the X to remove the filter tag, AtoM will reload all search/browse results (i.e. the page will no longer be limited to the selected archival unit). The top-level record for the selected archival unit (for example, the fonds or collection description) will not be included in the results. The “Browse as list” option will only return results for children of the top-level record. You can continue to apply further facets and fliters as desired to narrow your results within the selected archival unit. There are two options for browsing within an archival unit included here - the “Browse as list” button, and the “Browse digital objects” button. Additionally, if it has been configured by an administrator, there may also be an option to view an inventory. 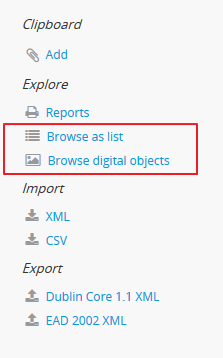 This section will describe the “Browse digital objects” button - see the Browse digital objects button section above, and the Browse inventory list section below for the other options in this part of the context menu. The “Browse digital objects” button will allow you to explore the digital objects associated with descriptions included in the target archival unit, on a dedicated browse page described in the Browse digital objects section below, but limited to that specific descriptive hierarchy. In the right-hand context menu, locate the Explore section - you will see browse options listed there, including the “Browse digital objects” button. Click on the “Browse digital objects” link. AtoM will redirect you to a digital object browse page, limited to the current archival unit - this will be indicated by the filter tag at the top of the browse page with the name of the top-level description. If you click the X to remove the filter tag, AtoM will reload all digital object browse results (i.e. the page will no longer be limited to the selected archival unit). The top-level record for the selected archival unit (for example, the fonds or collection description) will not be included in the results. 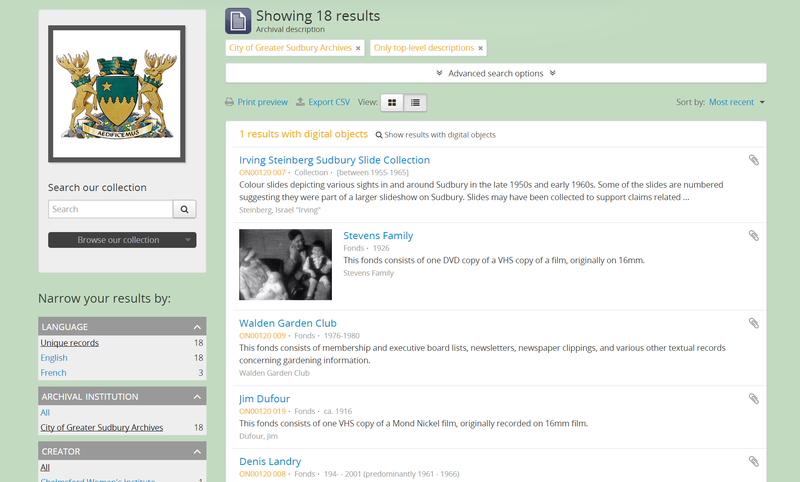 The “Browse digital objects” option will only return results for children of the top-level record - so if there is a digital object attached to the top-level record, it will not appear in these results! The Inventory list allows an administrator to make a page of lower- level descriptions contained within a parent record available on a separate inventory page formatted as a table with sortable columns. The Inventory list requires configuration by an administrator before it will appear in the AtoM user interface. For instructions on configuring the Inventory, see the Settings page; specifically, Inventory. Only the digital object and the Clipboard columns are not sortable. The Digital object column will provide an indication of whether or not there is a digital object attached to the description - if so, the row will have a hyperlink called “View” in the Digital object column. Clicking on the “View” link will take a user directly to the master digital object - if a user does not have permission to view the master, the column’s value will be empty for that row. The clipboard column contains links indicated by the paper clip icon. Clicking on one of these will add the description in the related row directly to the Clipboard. For more information on working with the Clipboard, see: Clipboard. Whether or not the Inventory link appears on a particular description will depend on how it has been configured in the settings page - there, an administrator determines which levels of description will be included (see: Inventory for more information). If the current archival description you are viewing does not include lower-level child descriptions matching the settings, no link will appear. Because it is configurable, an inventory list may not include ALL lower-level records available in a particular archival unit. For example, if you viewed the inventory page from a fonds-level description that included sub-fonds, series, files, and items, but the administrator has configured the inventory settings to display only files and items, then at the fonds level, the inventory list will display all files and items (including those contained within lower-level subfonds and series), but the subfonds and series records themselves will not be included on the inventory page. Similarly, the Inventory link will only appear on parent records - for example, if you are viewing a file that is part of a series, you would need to navigate to the series record to see the inventory link. Navigate to the archival description whose children you would like to explore. For more information on navigation in AtoM, see: Access content. If you are looking for a particular record in an archival unit (such as a series in a fonds), the other entries in this section might be useful to you! See above and below, Browsing within an archival unit’s hierarchy. 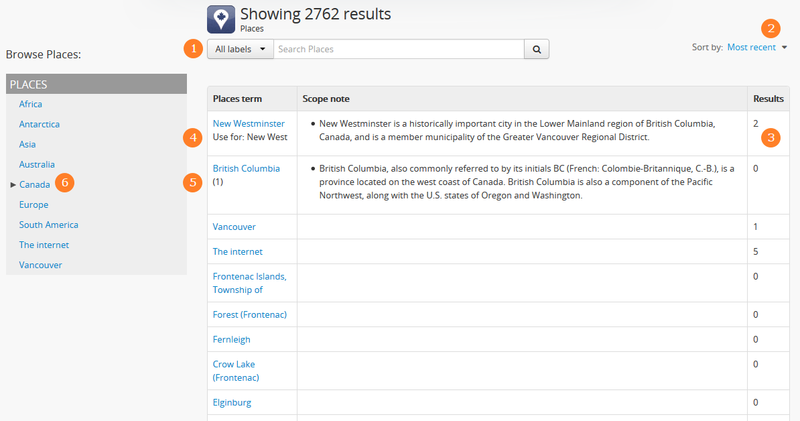 See also: information on using the Treeview for navigation, and information on the Treeview quick search. Click on the “Inventory” link. AtoM will redirect you to the inventory list of lower-level records for the chosen description. The Inventory list page will include the title of the parent description, as well as a breadcrumb trail back to the top-level description for the archival unit. On the right-hand side of the page, a button to return to the view page of the parent archival description is also included. The column headers of the inventory list that appear in blue can be clicked to sort the inventory list by that column. Clicking again will reverse the sort order of the column (for example, from A-Z to Z-A). The only column that cannot be sorted is the Digital objects column. The Digital object column will indicate whether or not there is a digital object associated with the archival description listed in the inventory list row. If there is, and the user has sufficient permissions to view the master digital object, then AtoM will provide a direct link to the master digital object. By default, public users who are not logged into AtoM do not have permission to access the master digital object for locally uploaded digital content. This can be changed by an administrator via Admin > Groups - edit the archival description permissions for the “anonymous” group to grant permission to “View master.” See: Edit permissions and Manage user accounts and user groups. Note that the above means that there are many possible scenarios where a digital object is attached to a description, but there is no indication of this in the Inventory list - it will depend on the access privileges of the user viewing the inventory list. If there are more than 10 results, a pager, with a count of the total number of results above it, will be included at the bottom of the page. 10 results per page is just the default setting in AtoM, but this can be adjusted by an administrator via Admin > Settings > Global. For more information, see: Results per page. The number of results included on a single page of the inventory list is controlled by this global setting, which affects all paged-results in the application. If you click the “Browse all descriptions” link included at the bottom of the Quick search results, AtoM will redirect you to a search/browse results page, limited to the current archival unit. The Quick search bar will accept Boolean operators (see Boolean operators for more information), including the ** * ** wildcard character. If you just want to use the Quick search to access the browse link, you can enter an asterix and press enter - AtoM will return a subset of all results, and then provide the browse link. In AtoM, people, families and organizations (also referred to as corporate bodies) are entities which are controlled by authority records. Any of these entities can be browsed in the Browse menu. Click the Browse menu, then click on People and organizations. The automatic sort is alphabetic for unauthenticated (e.g. not logged in) users, which can be changed by the user to Most recent or identifier via the Sort button at the top right of the page. Users can narrow the results list using the available facet filters on the left-hand side of the screen, which for authority records includes language, entity type (Person, Family or Corporate body), Maintaining repository, and Occupation. The authority record browse page also includes a dedicated search box - for more information on searching for authority records in AtoM, see: Authority record search. For general information on working with authority records, see: Authority records. In multi-repository installations users can browse a list of archival institutions represented in the database. Click the Browse menu, then click Archival Institutions. In the table view, the columns that appear as blue hyperlinks (the Name, Region, and Locality columnns) can be clicked to sort the results alphabetically by that column. Click the column header once to sort in descending (A-Z) order; click again to sort in ascending (Z-A) order. An administrator can set the default view for the archival institution browse page, in Admin > Settings > Global. For more information, see: Default repository browse view. 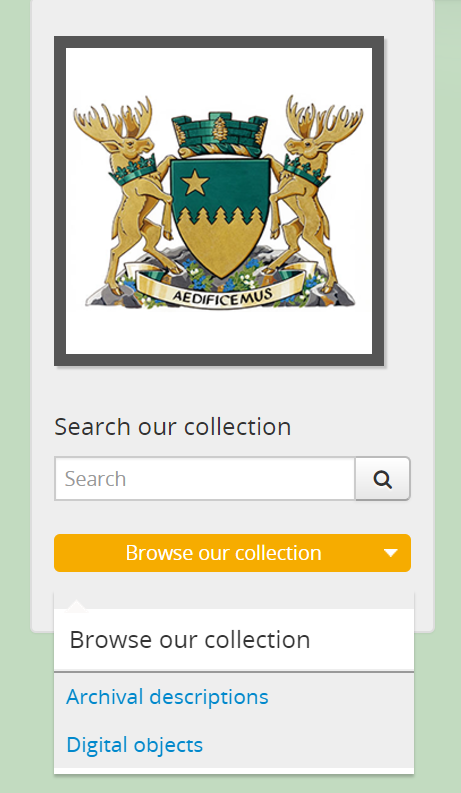 If the institution has uploaded a logo as part of their institution record, the logo will be displayed in the browse display (see: Add/edit a logo to an existing archival institution. If not, text will be displayed instead. 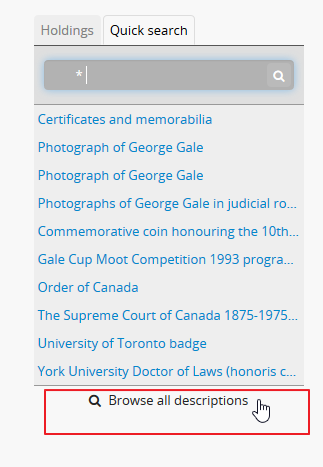 The archival institution browse page also includes a dedicated search box, and further filters available under the “Advanced” button that appears below the search box. 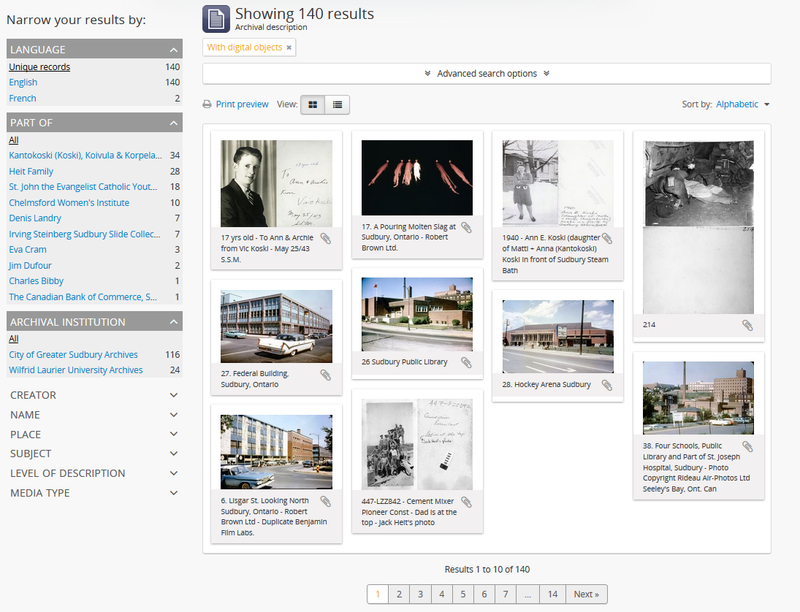 For more information on searching for archival institutions in AtoM, see: Archival institution search. For general information on working with archival institution records, see: Archival Institutions. When a user clicks on a result in the archival institution browse page, they are taken to the view page for the selected repository. 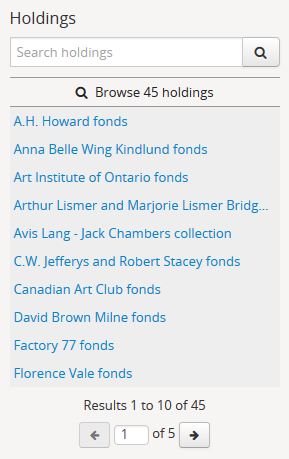 This view page includes a list of holdings - archival descriptions that have been linked to the current repository. For more information on linking a description to an archival institution, see: Link an archival description to an archival institution. When linking a repository to an archival description, link only at the top level of description - AtoM will automatically inherit the repository to lower levels of description (e.g. children). If you link at all levels, it can not only impact performance, but it will also mean that each lower-level description will appear in the holdings list, instead of just the parent description. The holdings list can be used to browse the holdings of a particular archival institution, which can be especially useful in a multi-repository AtoM instance, such as a union catalogue, portal site, or network. It appears in the left-hand context menu of the view page for an archival institution, beneath the logo. The search box on the holdings list will search all indexed fields in all descriptions related to the archival institution. When used, it will take the user to a full search results page, limited to the current institution (as indicated by the filter tag at the top of the search results). See Search for archival descriptions for more information on using the search results page. Below the search box, is a holdings browse link, that lists the total number of holdings (e.g. top-level descriptions linked to the repository). Clicking on this link will take a user to a browse page limited to the current repository, and filtered to display only top-level descriptions. Users can remove these filters by clicking the X next to the filter tag to broaden the results. See Browse archival descriptions above for more information on browsing archival descriptions in AtoM. Below the search box and holdings browse link, an alphabetized holdings list appears. The list consists of hyperlinks - clicking on one will take the user to the related description. The number of results in this list per page is controlled by the “results per page” setting found in Admin > Settings > Global. See: Results per page for information on changing this value. The default value in AtoM is 10 results per page. A holdings count appears under the holdings list, which includes the number of results per page, and the total - e.g. Results 1 to 10 of 45, etc. If there are more holdings than the number of results per page, a pager will be included below. Click the <- back and forward -> arrows to move through the pages. The current page number is listed between the navigation arrows. For large results sets, you can also manually enter a number into the current page number box - the holdings list will jump to the appropriate page. Any invalid numbers (e.g. entering 1000 when there are only 10 pages) will be ignored, and after a moment, AtoM will replace the value with the current page number. AtoM includes an additional mode that can be enabled by an administrator via Admin > Settings > Global called Enable institutional scoping. 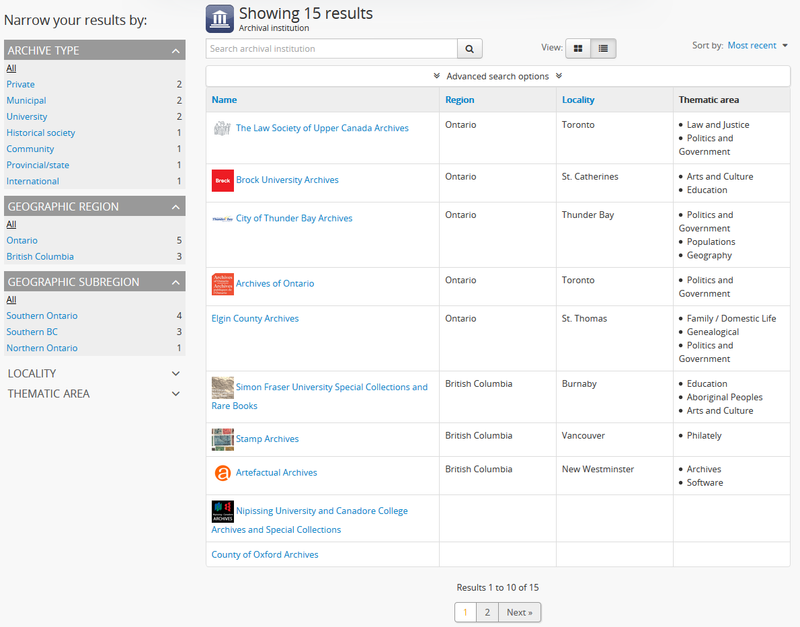 When institutional scoping is turned on, additional visual cues and user interface elements are added to better support searching and browsing within the holdings of one archival institution when used in a multi-repository system. 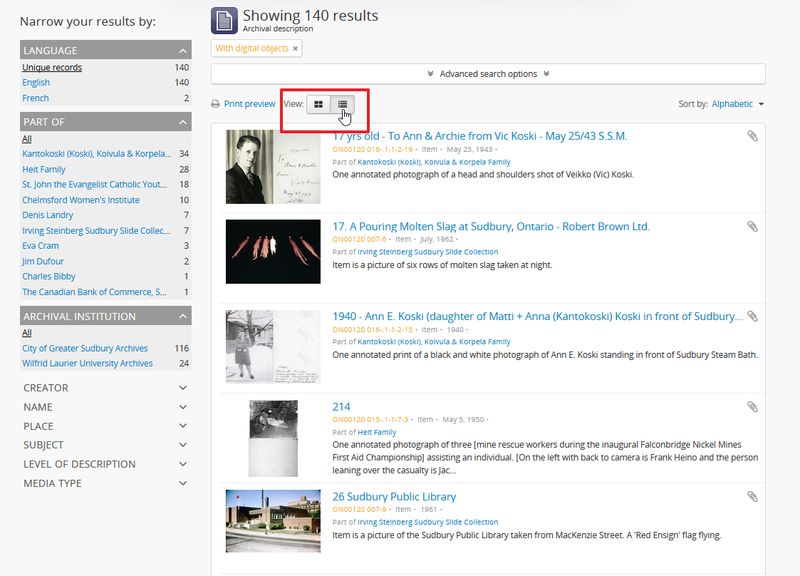 The most prominent of these changes in the user interface is the addition of the institution block, comprised of the repository logo, as well a dedicated search box and browse menu that will both return results linked to the current archival institution. The holdings list behaves the same as before (see above, Browse the holdings of an institution, for more information on how to use the holdings list). However, if you click on the holdings browse link, then the institution block will also appear on the browse page, offering an additional visual cue that you are viewing only the holdings of a particular institution. By clicking the X on the filter tag for the repository at the top of the browse results - this removes the repository filter. AtoM will reload the Browse page without the institution block and show all results. By clicking the “All” link in the Archival institution facet filter - this also removes the repository filter. AtoM will reload the Browse page without the institution block and show all results. By using the browse menu located in the AtoM header bar at the top of the page and selecting Browse > Archival descriptions. By performing a search via the global search box in the AtoM header bar at the top of the page. AtoM will return global results from all repositories when the global search box is used. For more information on using the elements of the archival description browse page, see: Browse archival descriptions. Additionally, the institution block introduces a dedicated browse menu for the holdings of the archival institution. The links in this menu will take users to browse pages that are already limited to the holdings of the current repository. If you follow these links, the institution block will remain visible on the related browse page, and if a background color has been applied to the instituion, it will also be present on the browse page. Institution scoping can again be removed at any time from these browse pages using the methods described above. 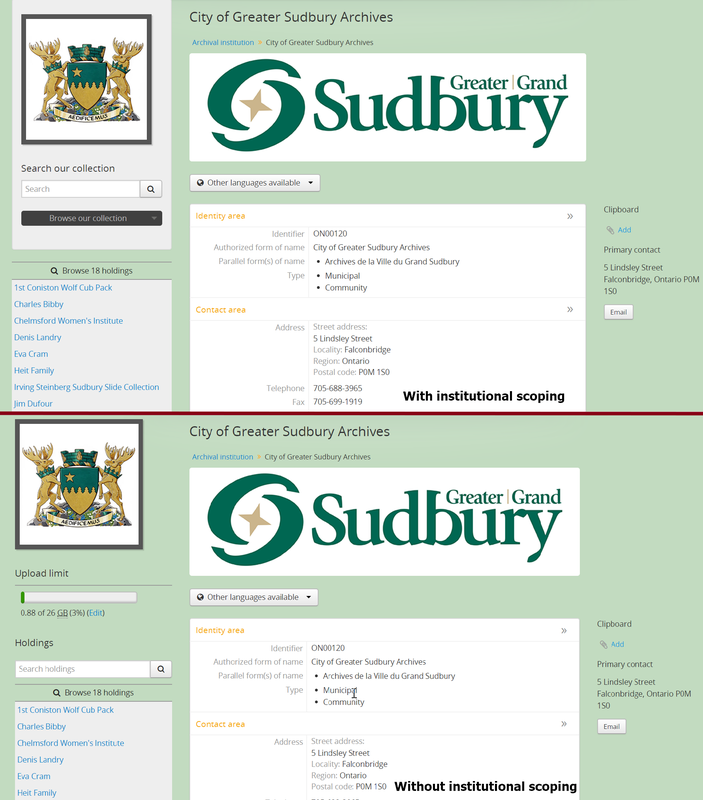 If an institution has linked its authority records (indicating that it is the institution responsible for maintaining them), then a list, similar to the holdings list, will appear on the archival institution view page. For more information on linking an authority record to a repository, see: Link an authority record to a repository as its maintainer. The maintained authority records list can be used to browse the authority records of a particular archival institution, which can be especially useful in a multi-repository AtoM instance, such as a union catalogue, portal site, or network. It appears in the left-hand context menu of the view page for an archival institution, beneath the logo and the holdings list. At the top of the maintained list is a browse link, that lists the total number of authority records maintained by the repository. Clicking on this link will take a user to an authority record browse page limited to the current repository. See Browse people, families and organizations for more information on browsing. Below the browse link, an alphabetized list of authority records appears. The list consists of hyperlinks - clicking on one will take the user to the related authority record. The number of results in this list per page is controlled by the “results per page” setting found in Admin > Settings > Global. See: Results per page for information on changing this value. The default value in AtoM is 10 results per page. A count appears under the maintained authority records list, which includes the number of results per page, and the total - e.g. Results 1 to 10 of 45, etc. If there are more maintained authority records than the number of results per page, a pager will be included below. Click the <- back and forward -> arrows to move through the pages. The current page number is listed between the navigation arrows. For large results sets, you can also manually enter a number into the current page number box - the list will jump to the appropriate page. Any invalid numbers (e.g. entering 1000 when there are only 10 pages) will be ignored, and after a moment, AtoM will replace the value with the current page number. Subjects and Places are two different kinds of terms, which are managed via taxonomies. 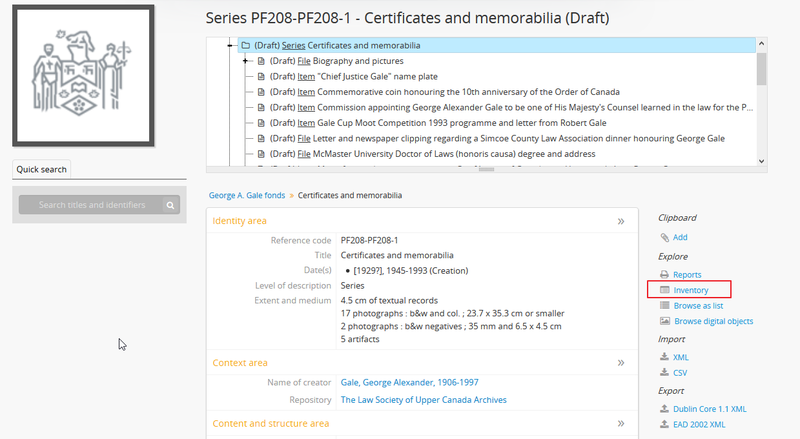 Subjects and Places, however, can also be used as access points associated with archival descriptions, and public users can browse terms and view published descriptions associated with those terms as access points. To do so, click the Browse menu, then click either Subjects or Places. The following images and instructions will use examples from the Place browse page - however, the page types are exactly the same for the Subjects browse. Once clicked, a user will be redirected to a browse page. The above image, from the Places browse page, has been annotated with with an orange and white number corresponding to each of the major features of the Places browse page. Each is described below. A dedicated search box for terms has been included on the browse page. The drop-down menu on the left side of the dedicated search box can be used to limit the search to the authorized form of name, the ‘use for’ label(s) (e.g. the alternate, non-preferred forms of name), or both. For more information, see: Terms. The sort button will allow users to sort the place or subject terms either alphabetically by title, or by most recently updated (e.g. added or edited). For more information, see: Sort button. An administrator can also configure application-wide defaults for public and authenticated users via Admin > Settings - for more information, see: Sort browser (users) and Sort browser (anonymous). The number of descriptions associated with a particular term as an access point is listed in the “Results” column. If alternate, non-preferred names have been added to the term’s “Use for” field, they will be displayed under the authorized form of name. If a term listed in the browse page has children (e.g. terms nested beneath it, to which it is the parent), a count of the direct children will be included in parentheses after the authorized form of name. A treeview is provided for browsing terms in the context of their hierarchical relationships. When first arriving on the browse page, top-level terms are displayed in the treeview. If a term has children, a caret (triangle icon) will appear next to the term - click the caret to view lower-level child terms. For more information on using the treeview in AtoM, see: Treeview and Terms treeview. A count of total terms is provided at the top of the browse page. Terms appearing in the first column of the browse page’s table are hyperlinks - click on a term to see further information about the term and related descriptions. AtoM will redirect you to a new browse page, described below. A breadcrumb trail is included to indicate the hierarchical relationships associated with a term - e.g. if it is the child of any other broader terms. Each breadcrumb is a hyperlink - a user can click one to navigate to the broader term’s browse page. For more information on breadcrumbs in AtoM, see: Breadcrumb trail. If the term description has been translated into other languages, a language drop-down will appear at the top of the term description. Opening the drop-down and selecting another language will flip the AtoM user interface to the selected culture and display any translated fields. For more information on multilingual use and design in AtoM, see: Translate. Additional contextual information is included in the context menu. For more detailed information on the elements of the context menu in this page, see the Subject and Place browse pages entry on the Context menu page. A treeview for navigating hierarchically organized terms is included in the left-hand context menu. Details on its features and uses are described here: Terms treeview. Information about the current term is displayed in the top portion of the page’s main column. This information is stored with the term in its taxonomy, and can be edited by authenticated (i.e. logged in) users with edit rights. For more information on the fields available and their uses, see: Term data entry. If a user is authenticated (i.e. logged in) and has edit permissions, a button block will be visible on the page, allowing the user to edit, delete, or add new terms. For more general information on working with terms in AtoM, see: Terms, and especially Term data entry. Public users who are not logged in will not see the button block. Below the term information, archival descriptions that are linked to the current term as access points are displayed as results. Clicking on a description result will redirect the user to the view page for that result. 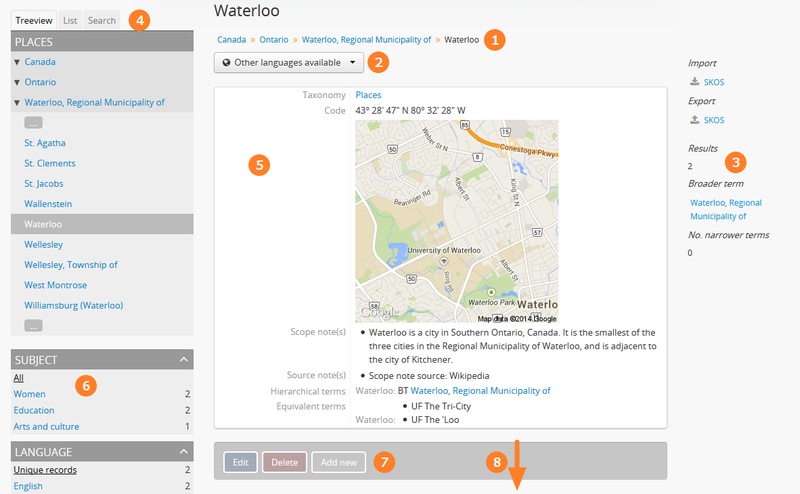 In the above example, the user has added the term “Waterloo” to the description - but the term is organized hierarchically in the Places taxonomy, and its parent terms are inherited. 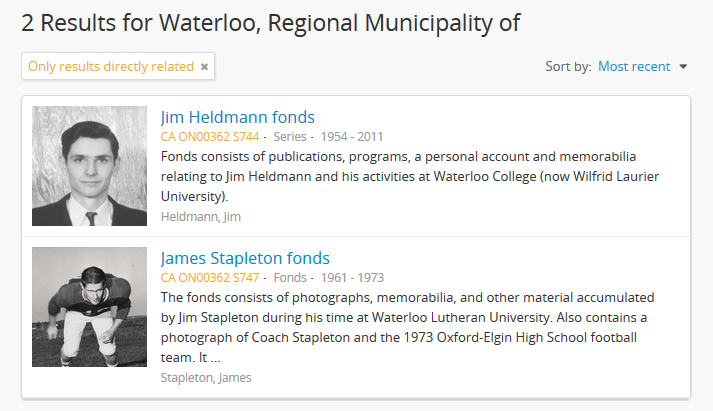 Because of this, when browsing results for the parent term “Waterloo, Regional Municipality of”, the example description will appear, even though the term was not directly added. Click the “Exclude narrower terms” button at the top of the results, and AtoM will reload the page, displaying only archival description results where the term has been directly added (and not inherited from a narrower term). A filter tag appears at the top of the narrowed search results indicating that only directly-related results are being displayed. To return to the previous view of all results, click the X on the filter tag - AtoM will reload the page and return to displaying all related results. Click the Browse menu, then click Digital Objects. AtoM will display all of the digital objects in the database. By default, AtoM will display 10 results per page; if there are more than 10 digital objects, a pager will be provided at the bottom of the results. Users can filter the results by media type by clicking open the “Media type” facet in the left-hand facet column and selecting a specific media type - default types in AtoM are audio, image, text, video, and other. Facets will not be displayed if there is only 1 or 0 results - so for example, if there are only images returned, then the Media type facet will not be displayed. The automatic sort of the results is alphabetic (title) for unauthenticated (e.g. not logged in) users, which can be changed by the user to various other sort options via the Sort button at the top right of the page. Administrators can change the default sort order on search/browse pages for both public and authenticated (i.e. logged in) users, in Admin > Settings > Global. For more information, see: Sort browser (users) and Sort browser (anonymous). For more information on the sort button in general, see: Sort button. Users can also use the other facets and filters available in the Facet filters and the Advanced search panel to furthe narrow results. Click the Browse menu, then click Functions. AtoM will display a list of the functions used in the database with the function types. Administrators can manage and edit the types of functions in Manage > Taxonomies > ISDF Function Types. See Functions and Terms for more information. When a user clicks on a function, the record for that function will display, including related functions and related resources. 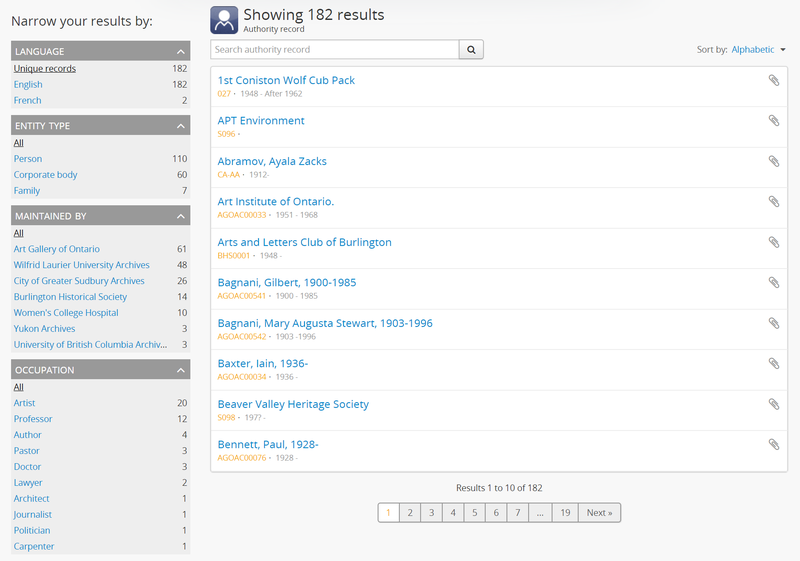 The functions browse page also includes a dedicated search box to help you locate records. For more information on its use, see: Functions. Authenticated (logged-in) users have access to browsing lists of accession records, donors, rights holders, and physical storage locations. For information on physical storage, see: Browse physical storage. Click on the Manage menu, then on Accessions. AtoM will display a list of all accessions by accession number as well as when the accession record was updated. When an accession record is clicked, the full record is displayed. Click on the Manage menu, then on Donors. AtoM will display a list of all donors by name as well as when the donor record was updated. From this screen, users can also search donors by name in the search box at the top of the results list. For more information on donor record functionality, see Donors. For information on searching for Donor records in AtoM, see: Donor search. When an donor record is clicked, the full record is displayed, including any related accessions and resources. Click on the Manage menu, then on Rights holders. AtoM will display a list of all rights holders by name as well as when the rights holders record was updated. From this screen, users can also search rights holders by name in the search box at the top of the results list. For more information on rights holders record functionality, see Rights. For more information on using the rights holder search box, see: Rights holder search. When a rights holders record is clicked, the full record is displayed.